We make a living by what we get—we make a life by what we give! Leadership Class Saturday, November 5th at 12:00pm for all Black Belt Club Members, please rsvp asap! Next Belt Test for those Little & Junior Dragons eligible Friday, December 9th at 6:30pm. Next Belt Test for Adults eligible Saturday, December 10th at 10:00am. Year end Student appreciation day sale Saturday, November 19th from 1:00pm to 5:00pm. 25% off all in-house school items and 10% off all Holiday catalog items with FREE shipping!!! 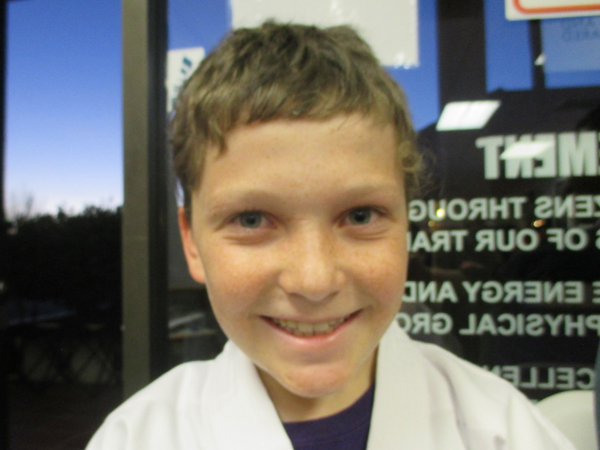 Quinn and his brother Luke started with our Black Belt school in January of 2016. It was apparent from the beginning that Quinn and his brother were serious students. Often when an instructor shows or offers something new in class, it is met with resistance from the students to try to learn something new. This is far from the case with Quinn. He embraces the challenge with a great Black Belt attitude that Sifu Rick & staff have not seen for many years! Besides being a serious student of the Arts, Quinn shows great Black Belt traits of honesty and courtesy throughout all classes, which is something that must be taught at home from an early age!!! Sifu Rick & staff would like to salute Quinn’s parents, Mike & Margaret, for their support of our Black Belt school and of Quinn’s training as well!!! November in the United States means celebrating Thanksgiving. The average family consumes a menu of turkey, stuffing, mashed potatoes, sweet potatoes, green bean casserole, cranberry sauce, a variety of other side dishes, rolls or bread and, of course, pumpkin pie. Alexandra Sifferlin, writer and producer for TIME Healthland, did the math and the typical Thanksgiving meal weighs in at about 4,500 calories, which is more than twice the recommended amount of daily calories for adult men and women. To put it into perspective, one Thanksgiving dinner is approximately equal to seven Burger King Whoppers®. At least we now know why we want to lay down and take a nap after we eat dinner? The question is this: do we have to eat 4,500 calories in one meal, or can we take the things we like and eat them in moderation? We also have to ask ourselves if we should prepare for this holiday by being serious about our daily workout regardless of what the workout is. Could we actually take the time on Thanksgiving Day to get our workout in? At the very least, these things may help offset the calorie count. We also have to remember this is the holiday season. During this time, with Halloween, Thanksgiving, and the December holidays rolling in, we tend to celebrate with high caloric foods, sweets, and possibly some alcohol. If you add to that the peer pressure presented by family, friends, and coworkers, and the prevalence of food-based marketing efforts, we may feel we are doomed. But are we really? We can leverage our will-power, our determination to not lose sight of our healthy eating habits, and our focus on our regular fitness regimen. We can make a plan to eat in moderation with an end goal of maintaining our current weight. It all comes down to attitude. Is the meal worth it? Maybe, but probably not. It is all about you and your long-term goals for health and fitness. With a little bit of planning, you can still enjoy the fun and fellowship of the holidays and feel good. How can you stay fit (or at least try to) during this family-feast holiday season? Below are five suggestions to help you eat healthy. Become fish friendly. If you have the opportunity to choose fish, take it. Choose dark meat. It has slightly higher calories but contains more vitamins and minerals. Easy on the gravy. If you can’t manage to skip it, reduce the quantity of your servings. Be picky about your side dishes. Eat steamed vegetables whenever possible. These are just a few suggestions. For the most part, common sense and basic eating habits are all that are needed. One of the very best methods is to simply push the plate away after the first (or second) helping. Remember, the key is not to avoid the holiday meals—but to enjoy them in moderation.